Pain relief is one of the most commonly reported benefits from people who choose to use CBD Oil. CBD’s all-natural properties make it a perfect solution for alleviating various types of pain. While CBD Oil for pain is still a relatively new treatment, it has been regarded as a “miracle compound.” Allow us to teach you what exactly CBD Oil is and how it works with your body to reduce areas of pain. Cannabidiol, often referred to as CBD, is one the many powerful cannabinoids found within the Hemp plant. CBD is a naturally occurring compound that has shown great promise in working with the human body to deliver numerous therapeutic benefits. At Nature’s Script, we use the CO2 Extraction process to derive our CBD from the Hemp plant. The CO2 Extraction process is a clean and eco-friendly method that allows us to attain a pure CBD Oil, free off any other compounds or chemicals. CBD has gained recognition for being a natural and effective treatment that carries anti-inflammatory and neuroprotectant properties. Unlike its sister cannabinoid, THC, CBD does not contain any psychoactive properties and is entirely safe to use and consume. How Does CBD Oil for Pain Work? Research shows CBD Oil has great success in helping combat pain because it interacts with one of your body’s most important systems, the Endocannabinoid System. The Endocannabinoid System, or ECS, is a structure of cannabinoid receptors that are located throughout your body. Your ECS receptors (CB1 and CB2) control vital life functions of your body such as maintaining your immune system, memory, appetite, sleep pattern, mood, inflammation and pain levels. Your Endocannabinoid System reacts to internal cannabinoids produced, but sometimes your body fails to provide enough. When you take CBD Oil sublingually, or under the tongue, it is absorbed by the mucous membranes in your mouth. Introducing CBD Oil into your system can help stimulate cannabinoid receptors. Your ECS’s CB2 receptor is responsible for monitoring pain-related conditions. CB2 receptors are positioned throughout your peripheral nervous system in white blood cells and the spleen. Once absorbed, CBD Oil binds to these areas and help modulate your immune system response to disease and injury. As a result, CBD Oil has shown to be extremely useful in reducing acute to chronic pain levels associated with headaches, migraines, muscles, joints, and much more. How Much CBD Oil fro Pain Should I Take? The straightforward answer when asking how much CBD Oil for pain you should take is variable. CBD Oil, like many other supplements, affects everyone differently. Factors such as gender, size, weight and metabolism rate may all come into play when you consume CBD Oil. At Nature’s Script, we considered this when developing our pure CBD Oil and is why we offer five different concentration levels. Our premium CBD Oil comes in the following potency levels: 300 mg, 600 mg, 1000 mg, 2000 mg, and 4000 mg. If you are unsure what dose to choose, we always suggest starting with our lowest dose and working your way up once you feel comfortable with the CBD Oil’s effects. For the best results, we recommend taking 5-10 mg of CBD Oil each day. 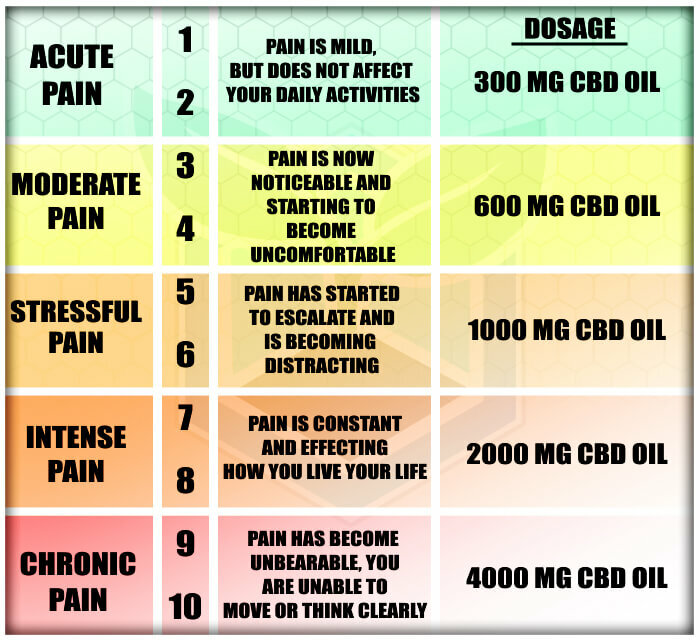 To give you an idea of what CBD Oil for pain you should take, we designed a traditional pain chart that a doctor may provide you during a visit. Learn about other conditions CBD Oil may help. CBD Oil Review – How Does CBD Affect the Endocannabinoid System? Join the NS newsletter to stay up-to-date on what is happening in the hemp industry. 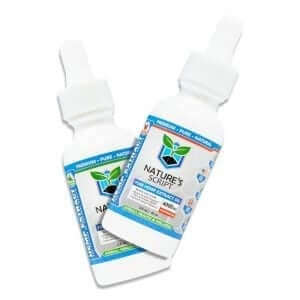 We will also notify you as Nature's Script™ expands its product lines. You will want to be on this list to always get the latest deals and updates on our products.